With Miles Peterson enjoying his retirement, Cypher, Biblegirl, and U.N.I.C.E. are introduced to their new team member, Josh Carpenter - the new Bibleman! Not to be outdone by a new Bibleman, the Wacky Protestor formulates a plan to not only re-invent himself, but to create a world where there will be no Christians, no churches, no Bibles, and no God!^^Using his latest anti-Christian invention; the neuroiconoclasticskeptisiser, the Wacky Protestor lures Vacation Bible School student leaders Gabriel and Olivia Phillips into his Animated Reconstructive Transport (A.R.T.). A world where there are no rules, no faith, no hope and no future.^^Will the Bibleteam be able to save Gabriel and Olivia before they are trapped. . .forever? Will the Wacky Protestor finally succeed with his latest plan? Join Bibleman, Biblegirl, Cypher and U.N.I.C.E. in their most exciting adventure yet as they practice 1 Timothy 1:18 and "Fight the good fight of faith"!^^Great for ages 3-93! 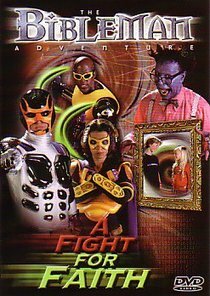 About "Bibleman: Fight For Faith (Bibleman Show Series)"